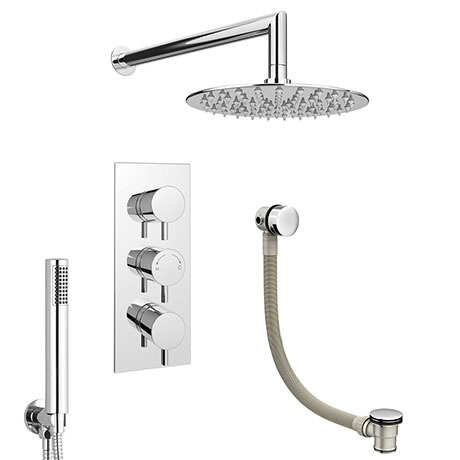 The modern Cruze shower package, this quality shower comprises of a triple concealed thermostatic shower valve with built-in diverter, ultra sleek wall mounted rain effect fixed shower head, shower handset and a slimline freeflow bath filler. The stylish concealed thermostatic triple shower valve offers thermostatic showering via three easy-to-operate controls. The diverter allows you to switch between three different outlets. Our range of Showers are ideal for renewing the style of your bathroom affordably. Connects to hot/cold water supply, flow and temperature control by shower valve. "Great looking shower, needs some careful thinking if the wall is thick."